I made one for World Pride and the other for Canada Day! I jumped on the bandwagon too, even though I’m pretty sure I’m well beyond the thing’s target age demographic! But it was kinda fun! I almost felt like I was crocheting. 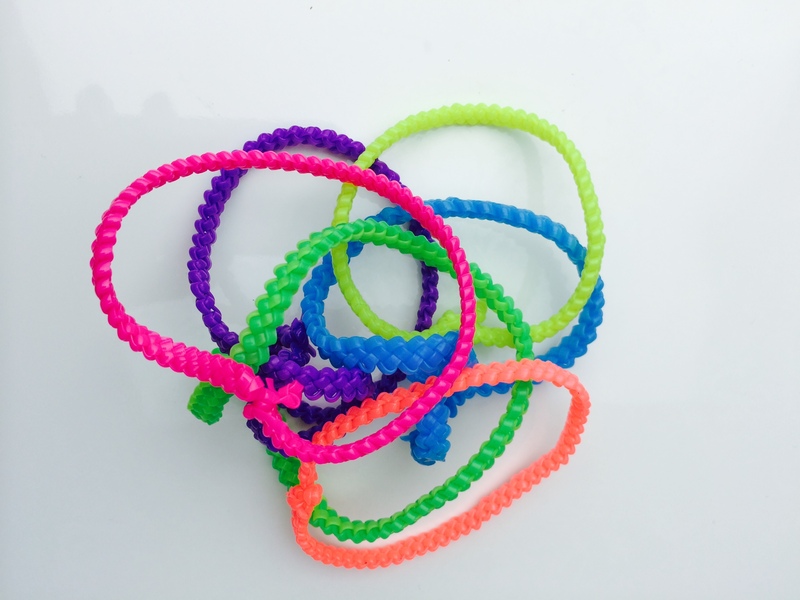 The Rainbow Loom bracelet craze seems to be this generation’s gimp bracelet. Now, that was my jam! I use to make gimp bracelets religiously as a child. And if I’m honest, I should mention that I took up gimping a few years ago when I made a colourful myriad of wrist decorations for Pride. And I did it again this year. It’s World Pride here in Toronto, I just have to be adorned! Click here for that video. While rubber bracelets are all well and good, I thought that there must be some other functionality these things could bring, so way they could be more useful to the over-20 crowd. I pondered how I could use it in a practical, functional way. 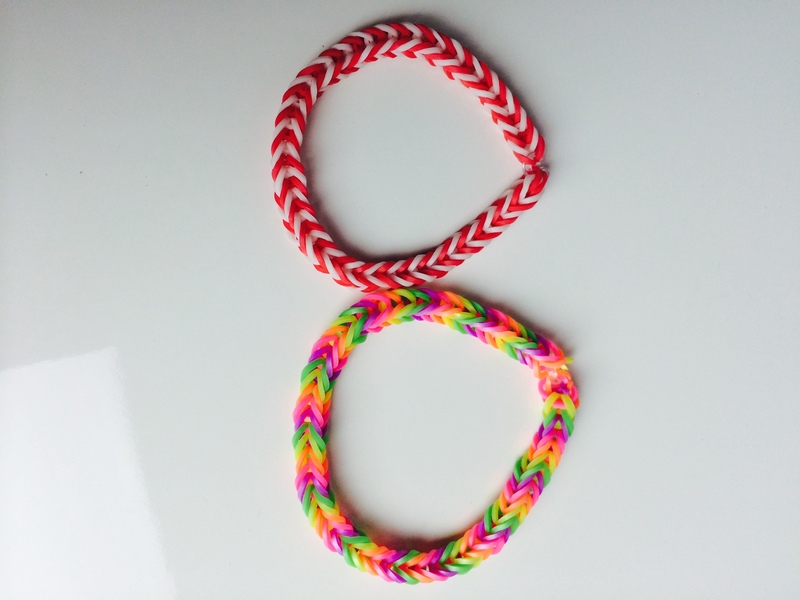 And then I had a brainchild – I could use the Rainbow Loom with my iPhone. You’re probably wondering how. I didn’t think it would bode well as a case – that would be a bit clunky. So listen to what I thought: you know how iPhones or any smartphone, really, is on the brink of death a few hours after it’s fully charged? And how you always have to walk around with your charger if you’re going to be out of the house for a full day? Well, that’s my life! 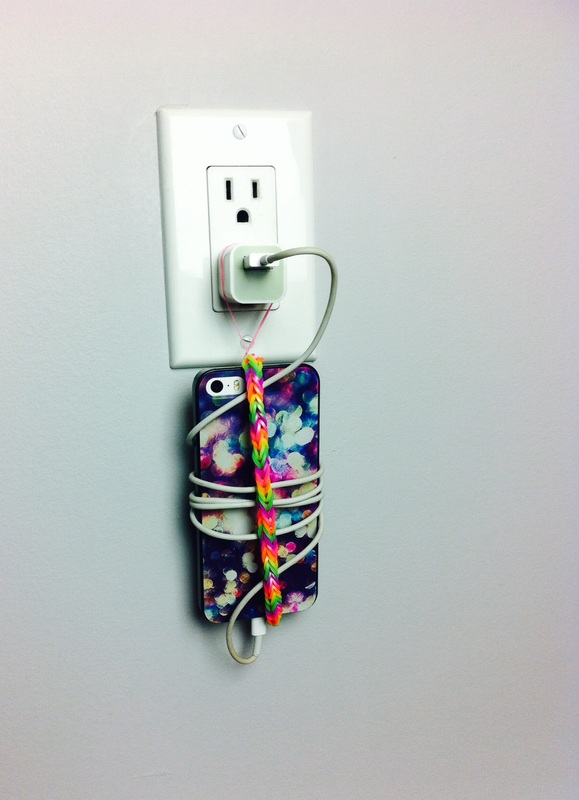 So I decided to make a phone holder using the Rainbow Loom. So this is how it works – you make a Rainbow Loom bracelet like normal. I have only mastered the fishtail design, so that what I did. In the C-clip, connect an additional rubber band. Now, your wrap the phone around the bracelet, and you wrap the extra rubber band around the plug of your charger. 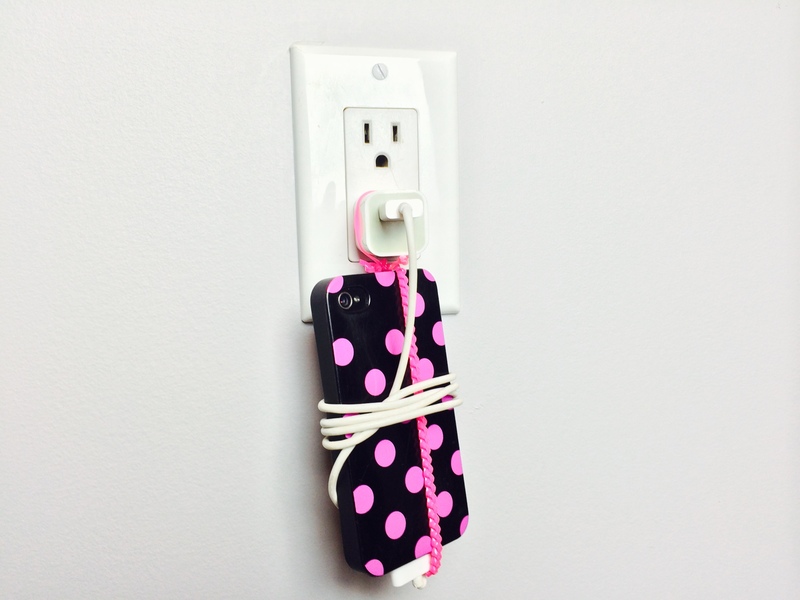 Connect the cord to the phone and to the plug, and gently wrap the cord around the phone, and voila! Your phone holder is instantly made! And why stop at just a Rainbow Loom holder when you can have a gimp holder as well? I’ve seen a few DIY phone holder/charging stations on Pinterest and the blogs that use old plastic containers, be it shampoo or lotion bottles, but what’s advantageous about my method using the Rainbow Loom or gimp is that it’s really portable. You can easily tuck it in your wallet, purse or pocket. As I mentioned before, as a 30-something year old woman, I found making both the Rainbow Loom and gimp bracelets/phone holders quite fun, so for all the adults out there, don’t think you’re too old to partake in an activity tweens love so much. And for you kids, school’s out for summer – do something nice for your parents and make them a phone holder the next time you want to make a bracelet. They’ll really appreciate it!